Heya cats and kittens! Remember when I said I was doing that family cookbook? Well, I finally got crackin, kicking it off with a recipe from my first cousin Nikki. 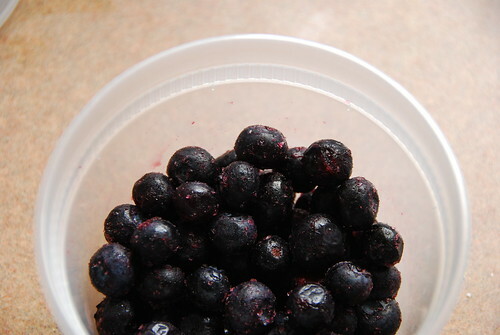 And hey, while I’m at it I’m going to share my secret for making blueberries more pronounced in my recipes. Nikki is maybe 6-7 years older than me (like all my cousins, my parents are both the youngest of four), and was there the day that I smashed all of my front teeth on the bike. I was 6 and have had to have lots of dental surgery since, so it’s not the fondest memory, but definitely the most memorable! She’s a very sweet gal, and I’m sad I haven’t seen her in several years owing to some missionary work she’s doing in some other country to which I’ve never been. One of the first steps is to make a well in the middle of the dry ingredients. As you can see here, my "make a well in the middle of the dry ingredients" skills are wanting. Moving right along, I decided to use frozen blueberries for my muffins, as blueberry season is over and I’m kinda broke at the moment. And now, folks, is the moment in which I share my super secret blueberry method. Put your blueberries in a container for which you have a tight-fitting lid, and scoop about 2 tsp of sugar on there (per cup of blueberries). Now put your lid on and shake it, shake it good. 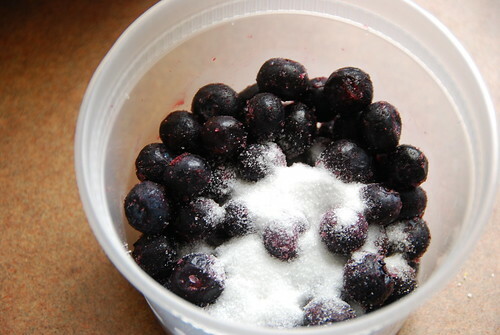 You want to coat the blueberries with the sugar. If you’re using fresh berries, I recommend shaking them with a tiny amount of water first so the sugar can stick. 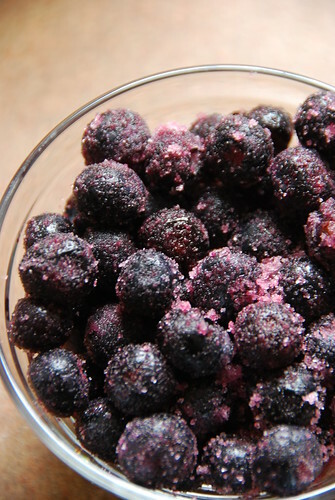 You’ll be left with beautiful crystallized-lookin blueberries. Look how pretty! I feel like recipes that call for berries are always really sweet, but the berries themselves are actually pretty tart. While this is refreshing when eating them fresh by the handful, in the context of the recipes they feel, to me, a little bit like an interruption in the flavour. 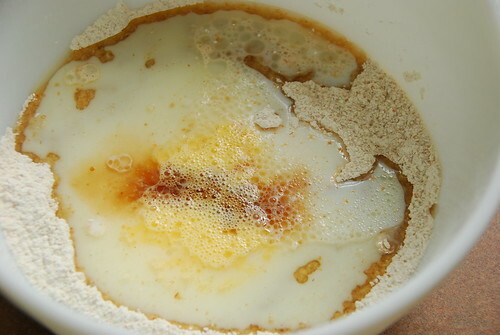 While the sugar-shake method doesn’t eradicate this entirely, it seems to help with a smoother flavour transition. Yes, I just made up that phrase. Next! Gently stir ingredients and remember, just until moist. Lumpy batter will always be lighter. Then fold in the berries. Now the recipe says to use paper liners, but I only caught the part about liners (general category), and I don’t like liners for my muffins at all because it gives the bottoms an excuse to get soggy as they cool. The result is a pan of batter, some of which is in foil wrappers, the rest of which are in none. 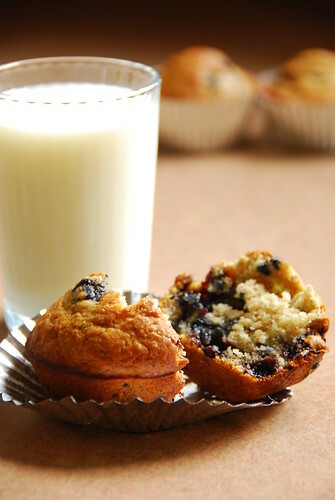 I wanted to be able to present the muffins as written, and though I failed, the liners attest to my best intentions. Also, note how I got my grubby little fingers in the bowl before I even took the shot. Mmmmm, batter! Oh oh and I almost forgot! 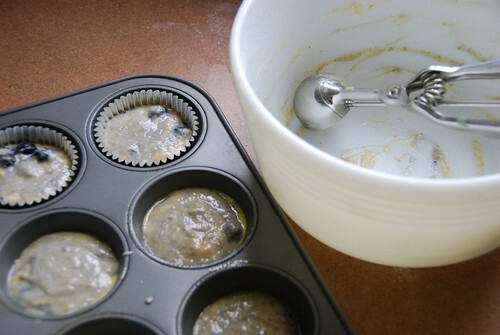 I read a really good idea somewhere (that I forgot while making the muffins): save some blueberries to put right on top of the muffins just before you put them in the oven. This will better distribute the berries all around (instead of just sunk at the bottom). Now for the last shot. I took like a bajillion trying to show the muffins as appetizingly as possible, and survey seems to say that this shot is best. And of course I like it because I’m a slave to low f-stops. But since I had to crop to a square, this one ended up in the book. So there you have it! The first of my paternal family’s recipe collection. 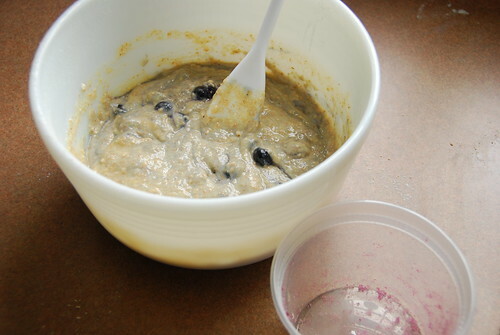 Sift dry ingredients in bowl and make a well in center. Add in wet ingredients and stir until moist. Fold in fruit and nuts, if desired, to taste. Fill paper lined muffin pan 3/4 full. Bake 35 minutes. Yum! Love blueberries. I love how you post each step, makes it so easy for people to follow. You are killing me with all of the beautiful fresh fruit! Even at the peak of summer we don’t have nice fruit like that here in our area. I am SO jealous! 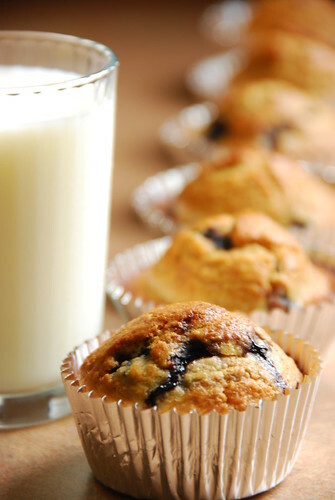 These muffins look great, BTW!! Hi! I found your blog a couple of weeks ago and last sunday I tried your cousin’s blueberry muffin recipe…the result was delicious! Thank you very much for sharing your ideas, recipes and lovely pictures!